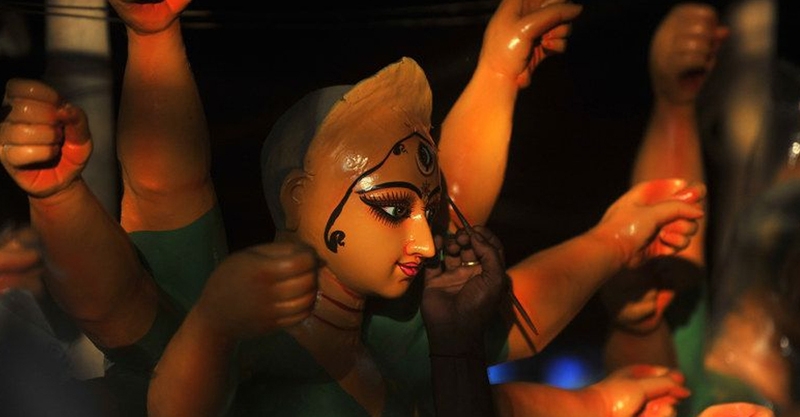 Four men were arrested and three juveniles apprehended for allegedly making fun of a man dressed as goddess Kali and then stabbing him to death, police said on Tuesday. The four arrested men were identified as Naveen (20), Aman Kumar Singh (20), Mohit Kumar (25) and Sajal Kumar Maheshwari (19), they added. On the intervening night of May 22 and 23, the body of a man was found from the NSIC jungle with multiple stab injuries on the chest, face and head. Kalu, an orphan, was raised in a “dharamshala” near Kalkaji Mandir, the police said. He used to dance and roam around with eunuchs. He was a devotee of “Maa Kali” and on Tuesdays and Saturdays, used to project himself as the goddess, wearing a black salwar suit with a red chunni and anklets, deputy commissioner of police (southeast) Chinmoy Biswal said. The police questioned several persons. On the basis of a tip-off, the accused, including the juveniles, were apprehended from Govindpuri on Monday, the DCP added.